Peter Barthel became the first director (Rector) of the Pre-university Academy (Scholierenacademie) of Groningen University, in 2005. This Academy, which recently celebrated its 12.5 years of existence, is now an important tool in the outreach towards secondary school students. The Science Hub Northern Netherlands (Wetenschapsknooppunt Noord-Nederland), targeting elementary schools was added in 2010. Many Children’s University (Kinderuniversiteit) lectures and lots of other inspirational activities have been offered since 2005. 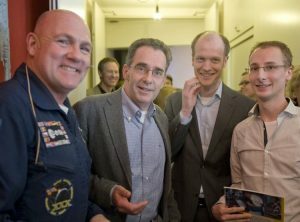 The picture below shows a lecturer (Dutch astronaut), director Peter Barthel, and Academy coordinators Arjen Dijkstra and Douwe van der Tuin. In July 2018 Barthel stepped down: prof. Diederik Roest became his successor.